This is the section in South Lanarkshire from near Roberton down to Hamilton. The Clyde Valley from Kirkfieldbank to Garrion Bridge is very fertile and enjoys a better microclimate than other areas. It was formerly used to grow vegetables, fruit and flowers for the Glasgow area. Some continues but competition from the Netherlands in particular has affected the trade. Many of the former glasshouses are now garden centres, some having restaurants which are very popular with local people. The following photographs of Dalserf, a pretty village with a famous church, were taken on the 26th July 2018. THese photographs were taken on the 16th August 2018 unless otherwise stated. Springtime in the garden at the Popinjay Hotel, Rosebank. Photo: 2nd May 2005. The large Gouldings Garden Centre and Restaurant, Rosebank. This is well patronised, especially the restaurant. The Flower Fairies Garden Centre, Rosebank (opposite Gouldings). Part of Reynard Nurseries. Valley View at Gouldings, Rosebank, a coffee shop, giftware and toy shop (opposite the main Gouldings buildings). There are many other enterprises at Rosebank connected with garden buildings and conservatories and with garden plants. Bridge over Clyde to Milton-Lockhart estate. 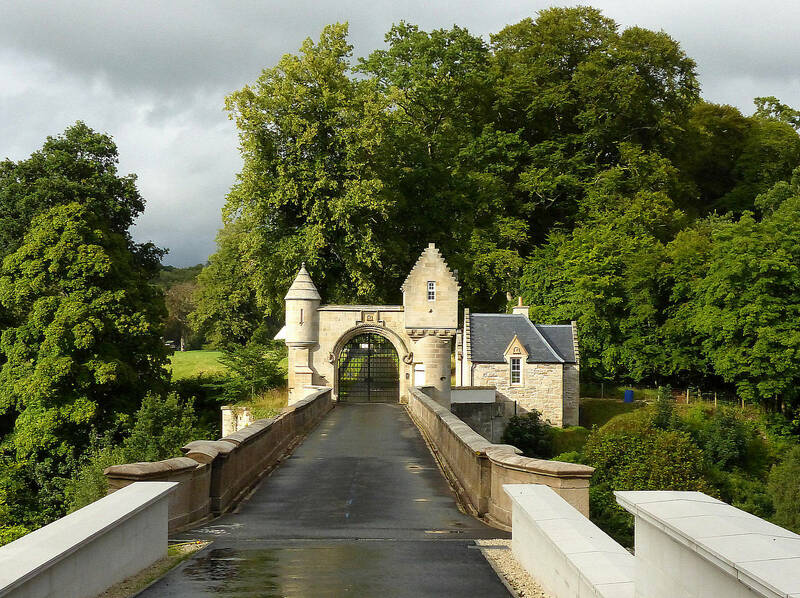 This bridge, near Rosebank, originally led to Milton-Lockhart House, but the house was dismantled stone by stone and shipped to Japan around 1988 where it was reconstructed as Lockheart Castle. Photographed by Rozsa Halls on the 6th August 2018. Crossford is in the Clyde Valley on the A72 road between Lanark and Hamilton. 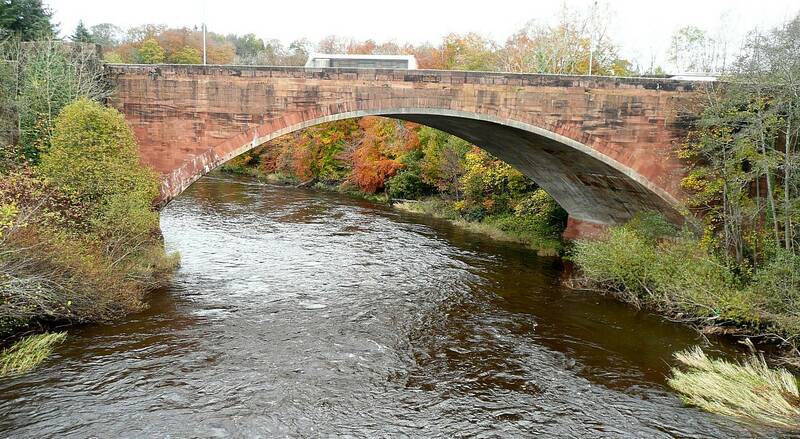 As the name suggests, this is a crossing point for the Clyde and a bridge takes traffic from Crossford to Braidwood. 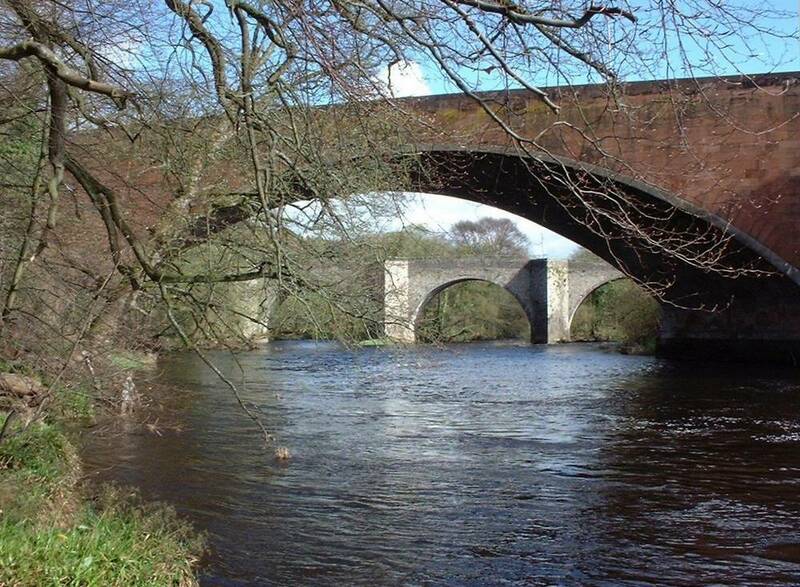 The older of these two bridges, Clydesholm Bridge, in Kirkfieldbank was built from 1696 to 99 and is the oldest surviving crossing on the Clyde. It is now only for pedestrians, having been replaced by the more modern bridge shown below. The newer single-span bridge in Kirkfieldbank was opened in 1959 to replace the bridge above which was too narrow for modern traffic. Both photos taken on the 28th October 2009. Springtime on the newer bridge in Kirkfieldbank. 2nd May 2005. View upstream from the old bridge in Kirkfieldbank. 2nd May 2005. The house of a keen gardener in Kirkfieldbank. Date 22nd July 2007.